Efficient cooperation between the EU and Russia will define the future of Europe. That’s why the EU shouldn’t waste any opportunity to unite with Russia in pursuance of a “prosperous future,” said Hungarian Prime Minister Victor Orban. Hungary backs Russia’s initiative of economic cooperation and free trade between the EU and the Eurasian Economic Union; Orban said in an interview to Kommersant published Friday, adding that in his view Europe cannot be competitive without Russia. Talking about the geopolitical tension between the West and Russia, he said that giving up an opportunity of peaceful cooperation would be a grave mistake. Hungary has suffered from both the EU sanctions and the reciprocal steps taken by Russia, he said, adding that the trade war mostly hurts Hungarian agricultural and investment sectors. Orban explains the reason for an outflow of Russian investment by the fact that Russia isn’t willing to fund a country that joined Western sanctions. Russia is Hungary’s largest trading partner outside of the EU, with exports worth $3.4 billion in 2013. Russia supplies 80 percent of the oil products and 70 percent of the natural gas consumed by Hungary. Stepping towards progress requires generosity, but it is a rare thing in Europe, Orban said, adding that EU countries should unite, but at the same time each of them should have its own vision on economic development. “We told the International Monetary Fund not to meddle. We said: ‘Your plan doesn’t suit us. We will solve our problems ourselves.’ And yet we’ve solved them! 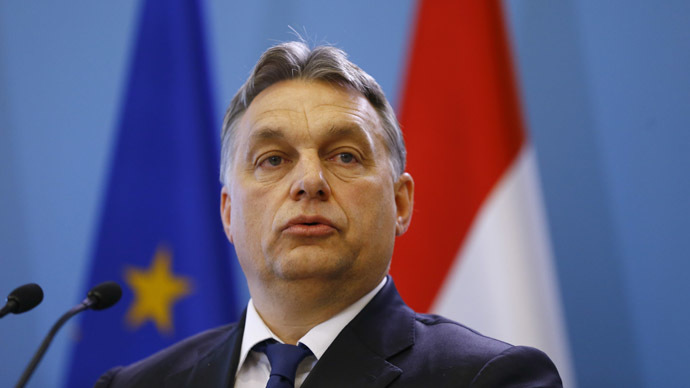 Hungary's economy is now one of the most successful in Europe,” he said. Talking about South Stream, Orban said the projects’ cancellation turned out to be a great loss for the Hungarian economy, as the initial plan envisaged that gas transit went through the territories of Greece, Macedonia, Serbia and Hungary. Russia suspended South Stream in December 2014 over the EU’s unwillingness to support the pipeline. Instead, Gazprom will build an alternative 63 billion pipeline to the Greek border via Turkey.